This post is a collaborative post with SANUS, all opinions and photos are my own. Father’s Day is just around the corner, and I have to say…I’ve got a tough Dad and Hubby to shop for. Not only is Father’s day difficult, but their birthdays are both within a month of Father’s day too. My husband’s lands in May and my Dad’s is beginning of July…so it’s a lot of work for this girl shopping for the guy’s in her life all in close timing. So this girl always needs help when it comes to Father’s Day gift ideas. 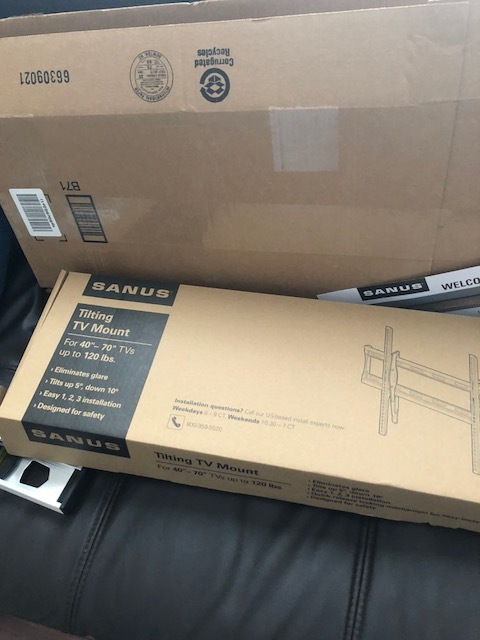 So, when I was contacted by SANUS about their TV mounts I thought this could be a perfect gift to give my dad. 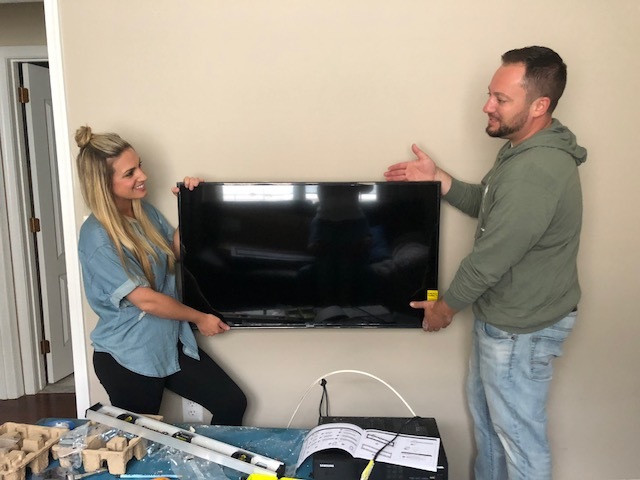 He has yet to buy a TV mount for either of his TVs in his house because of 1. he doesn’t want to spend the money and 2. he doesn’t know how to install one (not the handiest dad in the world). So, I asked my mom which of the TV’s in their house do they prefer a TV mount for and she mentioned the spare room since it’s where they take turns watching TV. 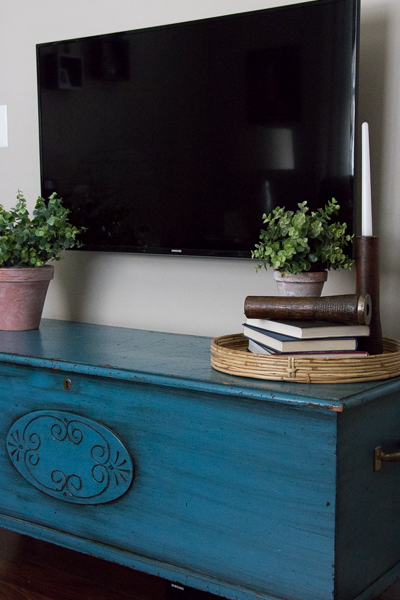 I thought this was perfect because not only would it be easier to hide from my dad, but also they have this beautiful blue chest that was handed down to them from my great uncle, and I knew styling the chest would be beautiful. Oh, and I may be stealing this once our house is built because I’ve wanted this piece for the longest time and just never had a spot for it in our last house. So, we thought perfect a great gift that he could actually use and we would install it and have it all set for him so he doesn’t have to stress about installing it himself. It’s either that or another Met’s t-shirt and since I’ve bought one for the last 3 years in a row I think the TV mount was a good idea. 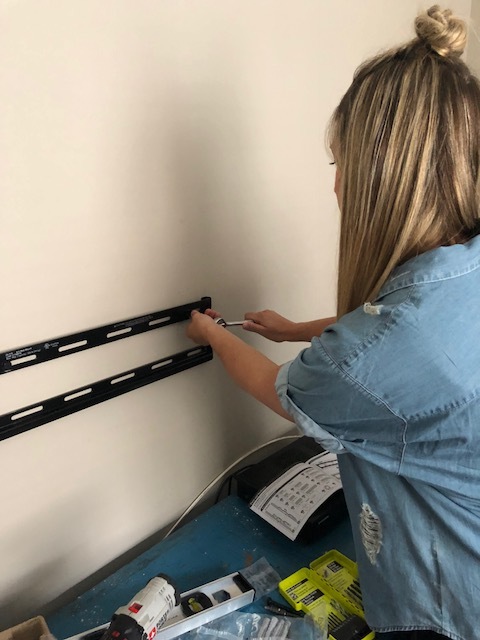 What’s amazing about SANUS TV mounts is that they are super easy to install. 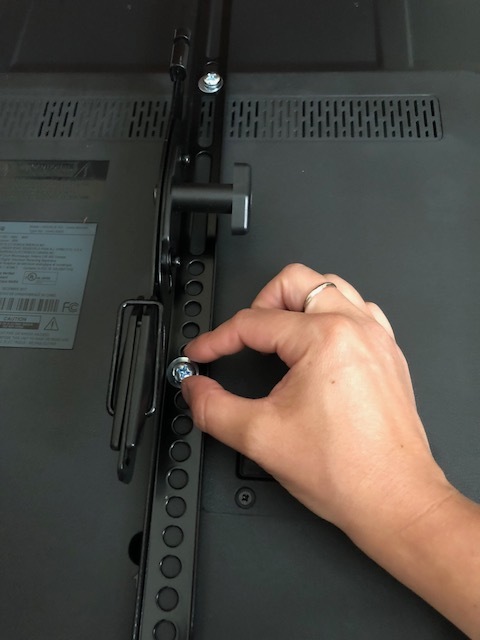 I had my husband walk me through it a bit as it was my first ever TV mounting… but it was so easy that I could pull this off again. 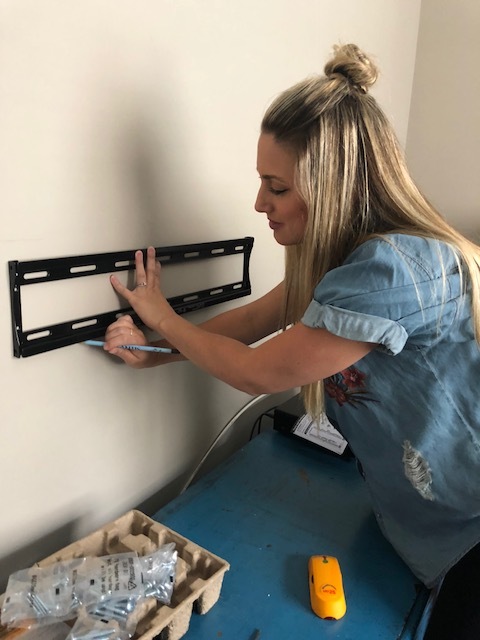 I was shocked that within a half hour I had the mount up on the wall, drilled a hole in the sheetrock to pull the wires through and with a little bit of help we lifted and placed the TV up on the wall. I mean I was amazed…I love learning more and more and really tackling things myself. Ladies, you got this! Also made it extra special since it’s for my Dad. 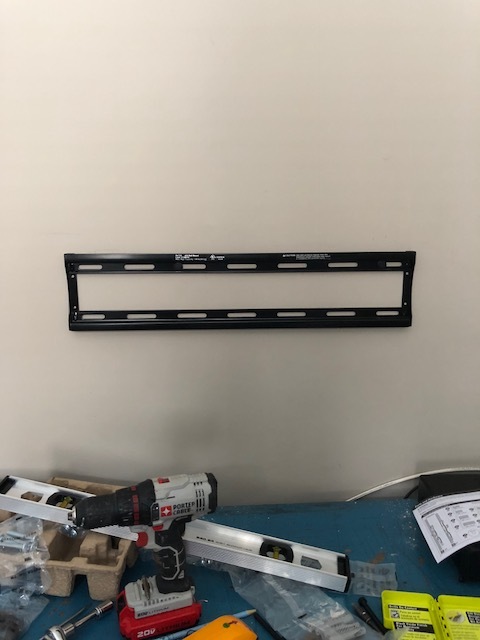 1Attach the brackets to the TV. 2 Install the wall plate. 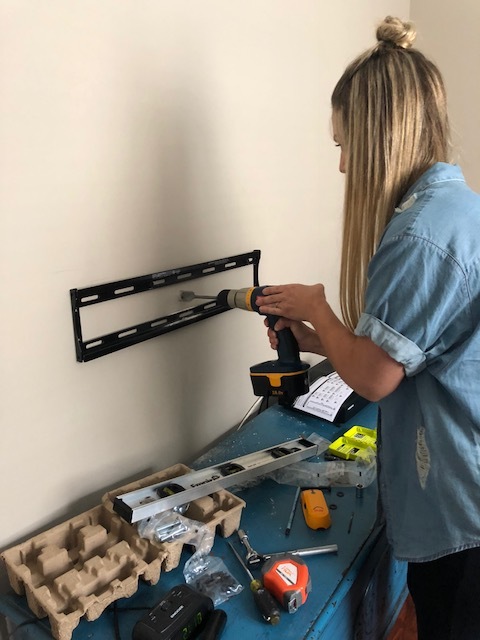 See more SANUS TV mounts here! Hopefully, that was easy to make out, for a video tutorial click here! 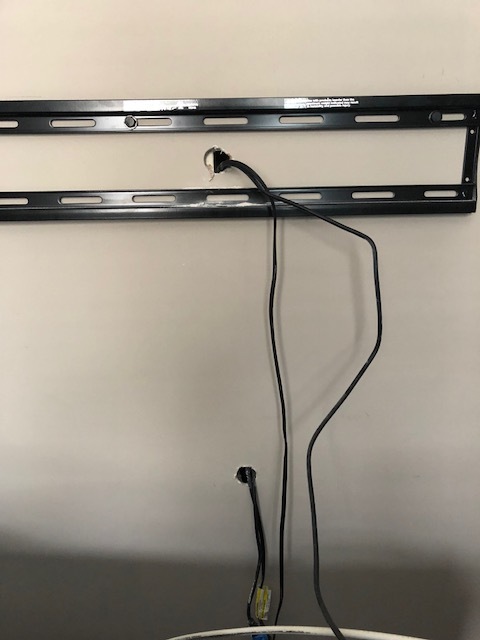 I love how close to the wall the TV is with the mount, but it also has full motion where you can move it side to side and tilts. 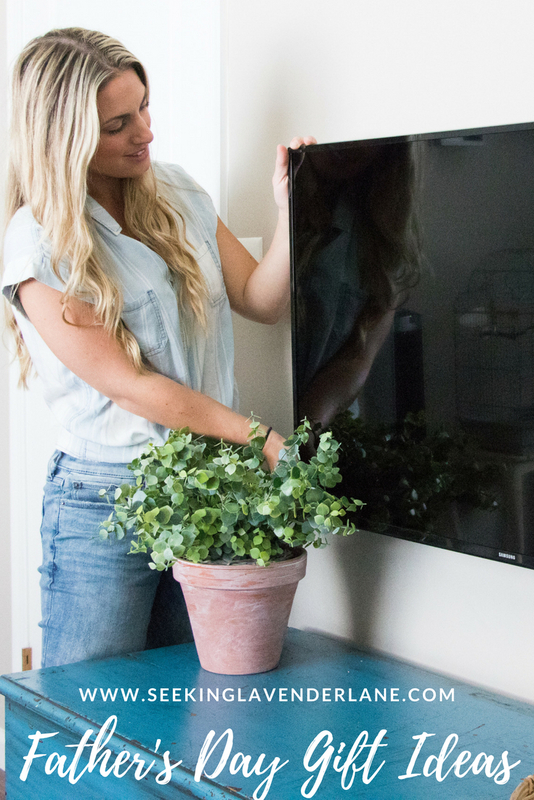 To decide which mount works best for you view the SANUS TV mount guide. I am beyond happy that I could offer this option for my parents and that they can now enjoy their TV from a comfortable eye level position. 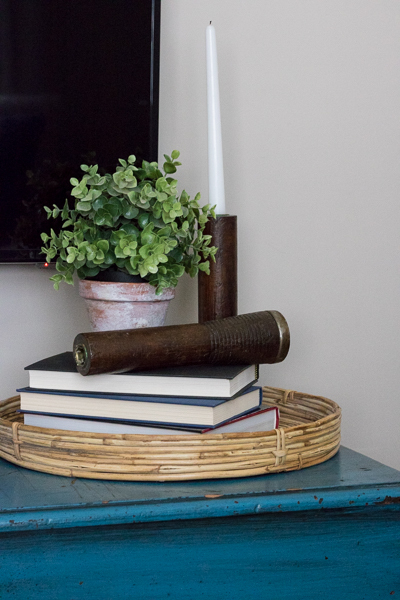 I threw in a few pretty accessories to jazz up the space. 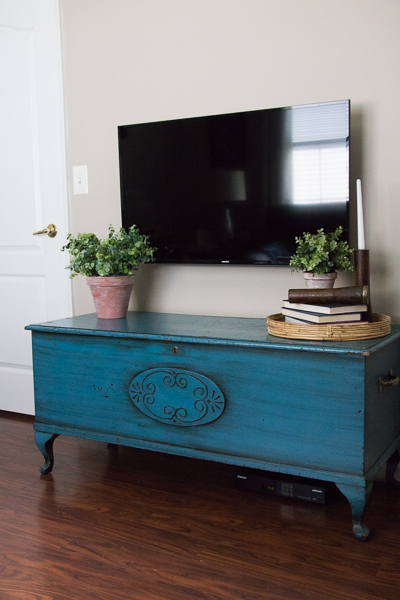 I love that having a TV mount allows that option to really be able to decorate your console (or in this case a vinatge chest) without working around the TV. Hopefully, this was helpful to bringing you a new idea for Father’s Day gift ideas. My Dad was pleasantly surprised and appreciated us installing the mount and having it all done for him and my mom. PLEASE PLEASE more on the reno of the RV! Cant wait to see all you’ve done! PERFECT !! 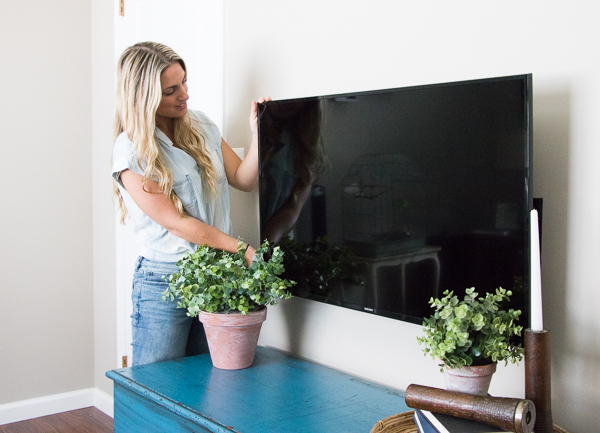 GREAT idea for a TV mount… !! take care… off to IG to see what is new with the Seeking Lavender Lady.🙃. Love how it hides all those ugly cords! I am thinking of adding a tv to our screen porch, so thanks for the tips! Such a great gift idea! I don’t know a dad that wouldn’t love this! What a great gift idea! I don’t know a dad that wouldn’t love this. We’ve actually been looking for a new mount for family room. Thanks for the suggestion!